House Cancels Vote On $659 Million Border Security Bill : The Two-Way Tea Party conservatives objected to sending money to the White House to deal with the immigration crisis, leaving the issue unaddressed as Congress gets ready to leave for a five-week break. Updated at 8:50 p.m. ET. 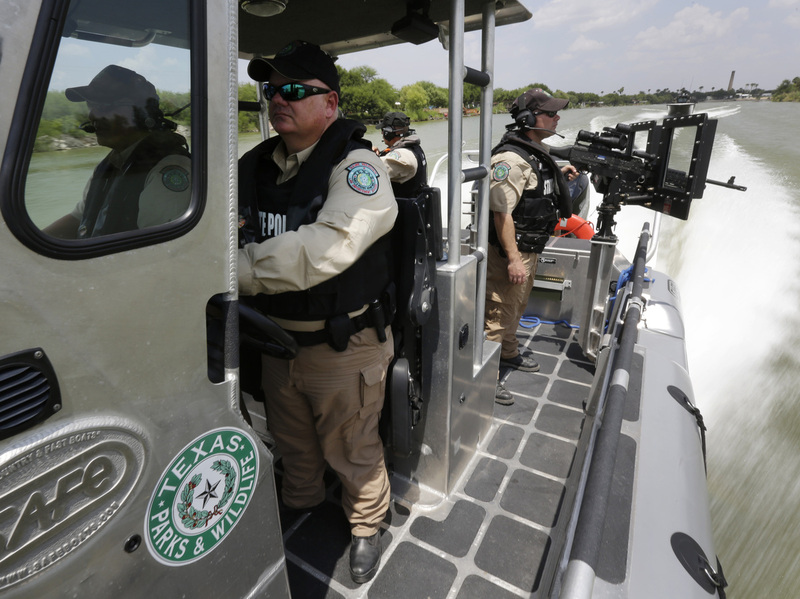 Texas Parks and Wildlife wardens patrol the Rio Grande on the U.S.-Mexico border in Mission, Texas, earlier this month. House GOP leaders pulled the plug on a $659 million bill to deal with the influx of tens of thousands of unaccompanied minors entering the U.S. from Central America. The vote on the legislation had been scheduled for this afternoon on the final day before the start of a five-week summer break for Congress. The bill would have increased funding for overwhelmed border agencies, add immigration judges and detention space, send National Guard troops to the border, and change the law so that the youths can be sent home quickly without deportation hearings that are now guaranteed, according to The Associated Press. "There are numerous steps the president can and should be taking right now, without the need for congressional action, to secure our borders and ensure these children are returned swiftly and safely to their countries," House Speaker John Boehner and other Republican leaders said in a statement. "We will continue to work on solutions to the border crisis and other challenges facing our country," they added. The collapse of the vote follows a surprise move by the GOP leadership to satisfy the Tea Party wing of the party by allowing a separate vote aimed at blocking the White House from expanding deportation relief. But the House bill was unlikely in any case to have gotten an airing in the Senate, which blocked a rival $2.7 billion measure for border security that does not include policy changes to expedite the deportation of migrants. Thursday night, the Senate rejected the emergency funding on a procedural vote, 50-44, "killing the chances of legislation reaching President Barack Obama's desk before the August recess," Politico reports. The legislation "was always a long shot needed to clear the chamber," Politico adds, "due to Republican opposition and lack of support from some moderate Democrats."